Although it has been recognized that the adsorption of organics to clay and silt particles is an important determinant of the stability of organic matter in soils, no attempts have been made to quantify the amounts of C and N that can be preserved in this way in different soils. Our hypothesis is that the amounts of C and N that can be associated with clay and silt particles is limited. This study quantifies the relationships between soil texture and the maximum amounts of C and N that can be preserved in the soil by their association with clay and silt particles. To estimate the maximum amounts of C and N that can be associated with clay and silt particles we compared the amounts of clay- and silt-associated C and N in Dutch grassland soils with corresponding Dutch arable soils. Secondly, we compared the amounts of clay- and silt-associated C and N in the Dutch soils with clay and silt-associated C and N in uncultivated soils of temperate and tropical regions. 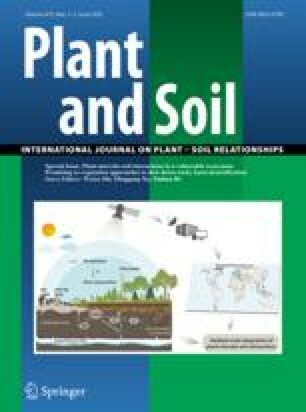 We observed that although the Dutch arable soils contained less C and N than the corresponding grassland soils, the amounts of C and N associated with clay and silt particles was the same indicating that the amounts of C and N that can become associated with this fraction had reached a maximum. We also observed close positive relationships between the proportion of primary particles < 20 μm in a soil and the amounts of C and N that were associated with this fraction in the top 10 cm of soils from both temperate and tropical regions. The observed relationships were assumed to estimate the capacity of a soil to preserve C and N by their association with clay and silt particles. The observed relationships did not seem to be affected by the dominant type of clay mineral. The only exception were Australian soils, which had on average more than two times lower amounts of C and N associated with clay and silt particles than other soils. This was probably due to the combination of low precipitation and high temperature leading to low inputs of organic C and N.
The amount of C and N in the fraction > 20 μm was not correlated with soil texture. Cultivation decreased the amount of C and N in the fraction > 20 μm to a greater extent than in the fraction < 20 μm, indicating that C and N associated with the fraction < 20 μm is better protected against decomposition. The finding of a given soil having a maximum capacity to preserve organic C and N will improve our estimations of the amounts of C and N that can become stabilized in soils. It has important consequences for the contribution of different soils to serve as a sink or source for C and N in the long term.